Jerry Bruckheimer and Johnny Depp know their way around a lucrative franchise that dabbles liberally and expediently in the magical filled with bombastic action as seen with Pirates of the Caribbean (2003) and it's near in-exhausted sequels. Bruckheimer and Depp share producer duties on their latest venture The Lone Ranger, based on the original 1933 American radio series. The Lone Ranger is the origin story of how John Reid (Armie Hammer) becomes theLone Ranger - the masked Texas ranger in 1869 who decides to fight for justice in the (still) Wild West. 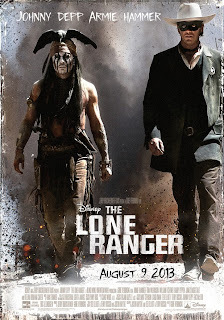 However, unlike other adaptations of the Lone Ranger story, Tonto (Johnny Depp) is no longer the Lone Ranger's Native American Camache side kick. Instead Tonto effectively helps to discover and create the mystique around the former lawyer. Depp's tenuous Native American heritage aside, Hammer is all Northern European tall good looks to Depp's easy second skin of eccentric outsider. Tonto (which means 'fool' in Spanish) is well suited to his penchant for the determined eccentrics who may or may not always have a designed plan as opposed to following feckless chance. With Pirates of the Caribbean's director Gore Verbinski in charge, there is a remarkable amount of film DNA shared between Pirates of the Caribbean and The Lone Ranger. Depp is a hair's trinket away from Captain Jack Sparrow in numerous sequences which is always entertaining but after 10 years of Sparrow, is now more than familiar. The action sequences feel applaudably physically visceral and come thick and fast not allowing the audience time to consider the unsteadiness of the film's ever dubious plot. Depp and Hammer create a pleasing slap stick comedic duo and the film is at it's best when both are on screen. William Fichtner gives real weight to the black magic element of the film as the villain Butch Cavendish, though Tom Wilkinson's Cole takes from the unnatural nature of Butch to represent the evils of greedy industrialism. Ruth Wilson is Rebecca the more or less crowbarred in love interest of the film for John. She has little to do bar be the lost love and vulnerable woman of the piece. Helen Bonham Carter as the local Madame Red has far more to contribute to the script with less screen time. At 2 hours and 39 minutes the film feels like multiple origin stories for the Lone Ranger all combined with nearly every piece of costume being given it's own personal exposition. The film also struggles to settle on a tone, flicking between real humour and true tragedy which, in more than one or two places, undermines both especially around the crime of genocide against the Native American nations. The 12A certificate feels strained in places towards what would arguably be a more interesting film aimed towards an older audience. Also the Lone Ranger isn't alone, he's with Tonto all the time.